For all orders placed before midnight on a Thursday will be dispatched on a Monday for delivery on a Tuesday. 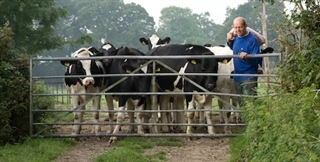 This is the story of our Farmer Steve 'The Moo Man' and how he and his father Phil who together decided to turn their back on the cost cutting supermarkets and dairies to sell direct. It will make you laugh on the rollercoaster of emotions of the strong relationship between Steve and our wonderful herd of Holstein Freisians. This product will be dispatched by first class Royal Mail delivery.